Ambikapur, Sarguja, Chhattisgarh from 15th November-2017 to 19th November-2017. This CG Recruitment rally test is to join as Airmen posts in Group Y Non Technical IAF (Security), Automobile Technician, Ground Training Instructor and IAF (Police) trades. Selection of candidates for Airmen Vacancies is based on written test, Adaptability Test-1, Physical Fitness Test, Adaptability Test-2, Medical Examination. Candidates will get Stipend during the training period is Rs. 14,600/- per month. On completion of training period starting gross pay is Rs. 26,900/- per month plus dearness allowance. 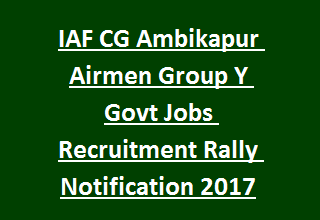 More details regarding Indian Air Force IAF CG Ambikapur Recruitment Rally for Airmen Group Y Non- Technical Vacancies Selection Procedure, Important Dates, Venue details, Age limit, application Procedure are given below. Go through the ISF Notification for Age related details. Check the CG IAF Notification for detailed qualification related information. Candidates will get Stipend during training period is Rs. 14,600/- per month. On completion of training period starting gross pay is Rs. 26,900/- per month plus dearness allowance. Indian Air Force Chhattisgarh is going to conduct recruitment rally to select talented/ qualified candidates for Airmen Jobs. Recruitment rally will be held from 15th November-2017 to 19th November-2017. 1. Written Test: Written test will be objective type and the duration of Exam is 45 minutes. Question paper will be in bilingual. Comprises of 10+2 CBSE syllabus and RAGA (Reasoning & General Awareness). Results for this written test will be announced on the same day. In this candidate able to adapt the environment of IAF and adjust to the military way of life. Candidates who have qualified Adaptability test 2 will be medically examined in the month of January-2018 at 3 Air Force Hospital Amla, Madhya Pradesh. Please check the IAF Notification for detailed selection process. Interested unmarried Indian Citizens having eligible criteria may visit the Indian Air Force official web link @ www.airmenselection.gov.in for updates regarding this Recruitment Rally. Eligible applicants have to bring their Original documents to the Recruitment rally site.